‘Jallikattu protests’ – People locked horns with the Establishment! With a gross mishandling in the clearing up of the massive oil spill near the shores of Marina and Ennore and the brutal murder of a dalit girl Nandhini – the Tamil Nadu politics is once again in appalling decay! In addition, the staged power handover to the late Jayalalithaa’s aide and the AIADMK general secretary V.K. Sasikala has again stirred quite a lot of people around. And this is looked down with contempt and disgust by a lot of ordinary people. 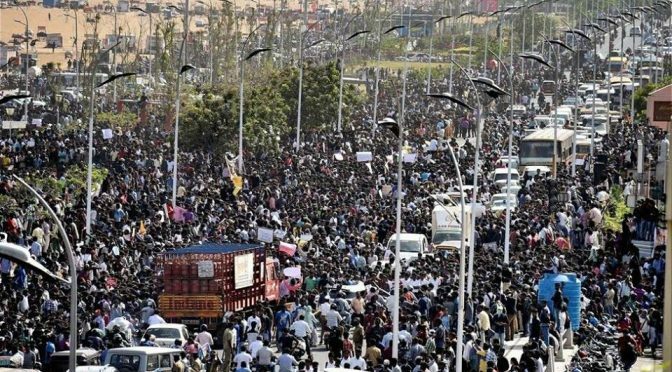 Days before many activists, students and political parties had gathered from Chennai and across Tamil Nadu in Alanganallur demanding to conduct Jallikattu, the epicentre dramatically shifted to Chennai Marina beach. And what happened afterwards is a massive display of defiance! A revolt however meager in its political and ideological maturity nonetheless overflowed with strong emotions and determination, and most importantly politicised almost an entire state in the landmass called India! The huge demonstrations against the Jallikattu ban and the subsequent heavy repression of the protesters, the fishing communities and slums nearby Marina have shown the extent of upheaval in Tamil Nadu politics. Despite being organisationally and politically uncoordinated the week long ‘Jallikattu protests’ were largely peaceful, displaying a sense of solidarity from many layers of the society with a huge participation and support from the middle class, with an enthusiastic presence of families and children making this a unique chapter in the recent course of Tamil Nadu politics. 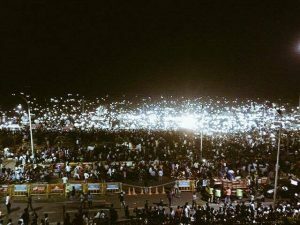 With the spontaneous gathering and flow of people, a heavy influence of the social network sites – the Chennai Marina beach protests in many ways resembles a local version of the ‘occupy movement’i. But now after the evacuation and the dispersal of the protesters with a very violent state repression, those fantastic days of protests remains still a yearning amongst everyone who till now are intimidated and found helpless against the establishment. Jallikattu, a traditional bull sport famously played in Alanganallur, a panchayat town in Madurai district and also in other parts of Tamil Nadu. It is a bull sport of its kind; it is also known as bull embracing, bull taming, etc. The common format of this sport involves a person to hold on to the hump of the bull that’s been released from the ‘vadi vasal’ (an entry gate of a closed space) for around 30 seconds to cover a distance of about 15 ft. The players are supposed to tackle a raging bull with bare hands and sharp reflexes. Even without delving more into the literary heritage and the cultural roots of Jallikattu – one can easily see the bond between the communities to their sporting traditions and how Jallikattu being played only in relatively few parts of Tamil Nadu has now almost leveraged itself to be a symbol of the ‘Tamil culture’! However looking back much before these huge sway of popular support against the ban on Jallikattu, there was to some extent mixed opinions among activists, political organisations and the larger public. This embodied not just subjective preferences but the clash of values and views among the layers of people reflecting the objective conditions based on their societies and their stages of development! Even before few years the opinions were sharply divided on the issue of Jallikattu. Those born and brought up in the city, particularly the affluent sections were not able to really empathise the rural or the agrarian values. The sport of the farm and the agrarian population had to come in terms with the growing sentiments of the urban elites on animal rights and also the personal safety of the players. Prior to the Supreme Court enforced regulations the ruggedness of the sport and the inadequate safety measures for both the animal and the player did concern a substantial lot of people. Also the Supreme Court suggested reforms in the game to improve the safety standards of the sport and also pressed the importance of ethical practices in dealing with the bull. The general assertion is that the reforms and standardisation of Jallikattu did improve the conduct of the sport and to an extent ensured protection to the bull as well as the life of the participant by mandatory veterinary services, ambulances stationing near the arena, disqualification of the participants on hurting the bull, supervision of authorities and representatives of the local administration and the animal welfare board, etc. Despite these gradual developments in the centuries old sport and the seeming adherence of the local communities to the rules and regulations that’s been introduced – the animal welfare groups continue the pursuit to ban Jallikattu. There were court orders banning Jallikattu and the state government facing popular pressure from pro-Jallikattu activists was forced to act upon their constituencies interests! Hence along with appeal process the Tamil Nadu government enacted a state law (Tamil Nadu Regulation of Jallikattu Act No 27 of 2009). The dynamics of the conflicting sentiments of the animal rights activists groups and the supporters of Jallikattu have seen a remarkable shift as the pro-Jallikattu campaigners were able to gather the public opinion towards their side of arguments. The discourse over the importance of Jallikattu as an incentive for the communities to retain the native breeds of bull like Kangayamiv – an excellent draught breed that is sustainable with the affordable maintenance of already deprived peasants, to affirm the right to cultural and traditional identity, etc. captured the interest and imagination of wider layers, especially the youth. At the same time the animal rights activists were pointing out the Court’s finding and expert opinions such as the inherent cruelty over the bulls possibly perpetrated in Jallikattu and the likely impact of lifting its ban – in other parts of India. Evidently as the protests were gathering momentum in Tamil Nadu similar demands were gathering pace against the ban of the traditional bull sports across India like Kambala (buffalo racing) in Karnataka, bullock cart racing in Maharashtra, etc. However it’s important to critically explore the vital issues of animal rights. Animal rights and welfare activism has its roots from a genuine rage against the industrial practices of slaughtering and denial of the dignity of the lives of the animals. Instead of targeting corporate practices of brutalities manifested over animals by the big businesses including horse racingv, these elite ‘so-called’ animal rights organizations are targeting the practices of sections of the ordinary people. There is no denial of the roughness and crudity that’s been often witnessed on the bulls participating in Jallikattu. While it’s absolutely true that as the society progress it’s important to do away with the regressive traditions and unethical practices but to just apply that bluntly and impose it on isolated issues like Jallikattu could be counterproductive. It is also important to understand that the objectives of animal welfare are essentially linked to the struggle for a better society which will ensure the needs of the people, pledge a decent society to ensure the welfare of all living organisms and the protection of our environment and nature. The Jallikattu debate also illustrated the rifts stemming from the existing social contradictions and evidently the elitist intellectuals, activists and even some political entities were critical about the barbaricvi, male chauvinistic, dangerously adventurist aspects of this sport. However, amongst the left and the progressive groups, the area of chasm was the casteist, and the feudal traditions of Jallikattu. The oppressive feudal reigns did spectacle Jallikattu to impose the hegemony of the powerful landlords over the toilersvii but at the same time the sporting field may be the only opportunity for the oppressed to challenge the feudal chief; but a lot of people amongst the dalit communities were excluded from participating! The zamindars and the feudal lords are no more but landlordism does existviii; the disparity between the landed and the land less does exist and also exists the caste oppression of the dalits. The 1997 Justice Mohan commissionix reported that the Jallikattu often precipitate the clashes between the backward castes and the dalits. Amongst the left, progressive as well as dalit organisations some did stay away from the pro-Jallikattu campaigns. Nonetheless the growing popular support against the ban on Jallikattu, particularly from the students and the youth – did galavanise political organisations to intervene. However those organisations who did speak against the ban, mostly sidelined the issue of caste oppression, and the legacy of systematic exclusion of dalits in this sportx. Despite all this, it’s very important not to burden and ward off the young and fresh layers who are actively campaigning against the Jallikattu ban with the feudal or casteist legacy and at the same time we need to intervene with our demands to take up that issue of casteism, and the marginalisation of the oppressed from the sport which is now claiming a pan-Tamil identity. As it is the duty of Marxists to take a stand against the relegation of the caste and the class contradictions, and it’s important particularly during a mass upsurge of this nature where a sense of popular unity among the people is consciously forged by the establishment forces. A real unity and equality among the masses can only be assured by thoroughly addressing those contradictions. Reform the Jallikattu sport to address the concern of the genuine animal rights activists, to ensure safety to the participants and others, and to outlaw any discriminatory practices. We also support the demand for the state government instead of the influential local private entities to conduct Jallikattu. Right to basic agrarian support and the right of the farmers over cattle ownership. Adequate support to participate in Jallikattu including the support to maintain Jallikattu bulls. Prioritising the issue of landlessness amongst the dalits and the oppressed communities and initiating a program of radical land reforms. While it is understandable that the immediate issue here is the ban on Jallikattu, a lot of people particularly the youth are disillusioned against the intervention of big businesses in their society. The plight of the farmers, the real threat of losing the native cattle breeds, crops and the soil fertility, the crushing burden of the World Trade Organisation’s policies impacting the sustainability of agriculture, the lack of material support for agriculture, the growing levels of exploitation of ordinary in every other sectors, etc., are all real threat which could only be challenged by a political philosophy that addresses the needs of the people, and the society. By the early weeks of January the Jallikattu issue was storming the news headlines, however it turned out to be a massive resentment. In the past few years for every January, despite all the other issues in a crises ridden society like Tamil Nadu – Jallikattu remains the hot topic. This is particularly so as issues like Jallikattu is tolerated by the establishment and it’s always a trouble-free, seasonal sensation for the TRP frenzy media channels. However with this time around the ferment has reached its point. Back in Jan 2016 the Supreme Court ruling issued an interim stay on the Modi led central government’s hasty and opportunistic gazette notification of removing bulls form the list of performing animals thereby allowing Jallikattu during the Pongal festivalxi. This year just a week before the Pongal festival – on the 8th January, hundreds of young people and students, turned up in Marina beach demanding the Supreme Court to lift the ban on Jallikattu. There were also student protests in other areas in Chennai. Sensing the mood, the Tamil Nadu Chief Minister O.Panneerselvam and the ruling ADMK’s party general secretary V.K. Sasikala’s carried out the rituals of requesting Prime Minister Modi to pass an ordinance amending the PCA Act to enable the conduct of Jallikattu but the central government did not comply. 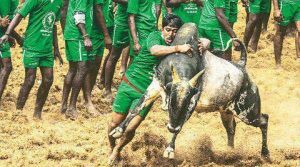 Meanwhile the Supreme Court rejected the plea to pass the judgment on the Jallikattu before Pongal which effectively means the conduct of the sport remains banned. This set off a stray of protests across Tamil Nadu and particularly in Alanganallur with the students and young people across the state poured in to express their overwhelming dissent over the ban on Jallikattu. Political parties and Tamil movie celebrities joined the agitation. Thousands of protesters remained in all day long in Alanganallur’s ‘Vaadi vaasal’-the Jallikattu arena. Despite the threat of lathi charge and repeated orders from the police to leave, the protesters refused to leave and around 200 people were arrested on 17th Jan, early morning after the night-long protests. On the 17th Jan students and youth gathered in Marina beach in support of those who are arrested in Alanganallur, with a spirited show of solidarity! The protesters gathered strength as more and more people turned up spontaneously. The gadget and the social media generation networked and swelled up one of the popular sea front in the world. More people, IT workers and volunteer groups joined the protesters. Suddenly with an unexpected turn of events the Chennai Marina beach was occupied by the protesters and this along with the next few days took the entire establishment by surprise. There were also spontaneous protests erupted across the state in Coimbatore, Salem, Erode, Nagercoil, Trichy, Pondycherry, etc. As things were going out of hand the Tamil Nadu State government pushed the central government for an ordinance to conduct Jallikattu but the Centre in-turn directed the state government to issue an ordinance. The draft ordinance was also cleared by the centre without any changes. The protesters were refused to give up without a concrete solution to lift the ban on Jallikattu thus putting the entire administration on its toes! Support was pouring in for the protesters from all directions. The protesters remained in the beach, some were going to work and joining the protests after their shifts, significant number of women and even families participated. Lakhs and lakhs of people turned up but the crowd was in control. Volunteers distributed food, water, snacks and even blankets for those who slept through the night. All the news media were carrying out live telecasts of the protests and in the trains, buses, and even in the Chennai city road traffic there were slogans and enthusiasm in support of Jallikattu, from those who apparently never played this sport in their life time! State wide general strike was called by the unions affiliated to the left parties and the opposition party DMK. Doctors, lawyers, IT workers did strike in solidarity with the protests. The farmers’ joint action council expressed their support to the protest and the small traders closed their shutters in solidarity. As the protests got intensified and the demonstrators sought permanent solution the state government issued the ordinance and it was cleared by the central ministry and the Chief Minister assured to pass the ordinance as a state law in the legislative assembly at the earliest. Despite all those assurances by the state and the central government the protesters remained critical as their demand to amend the PCA act by the central government was not yet met, and the risk of state government issued ordinance to be challenged again in the court persists. At one stage thousands of protestors assembled and refused to let Panneerselvam to inaugurate the Jallikattu event in Alanganallur and in Kovilpatti. The protests were largely peaceful, disciplined and well networked however it evidently lacked leadership and a structure. It was much decentralised and there was no sufficient coordination to determine the direction of the struggle. The slogans and the chant were mostly targeting Modi, Panneerselvam, Sasikala, Subramanian Swamy, PETA, etc. 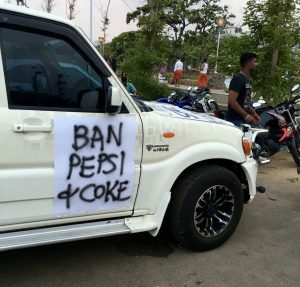 However there were serious voices amongst the protesters expressing the sorry state of the farmers, slogans against corporate businesses, calls to ban pepsi and coke, against the Indian state curtailing the democratic rights of Tamils, etc. Nevertheless with the lack of a decisive body the protests were split off as numerous groups and some were misled by the celebrities and single issue campaigners who sided with the government’s proposal and never really shared the determination or the fighting spirit among the protesters. As the government was able to influence this section of the people particularly the celebrities and the pro-Jallikattu organisations that were from the start are careful to direct the focus of the entire upsurge to the issue of Jallikattu. To an extent this caused confusion among the protesters and some of them did leave the protest but the determined sections refused to budge. With no intentions to yield anymore to the demands of the protesters beyond the ordinance brought in by the state government and with just few days for the Republic day, with the state ceremonies need to be conducted in the Marina the government forces forced the protesters to leave during the early hours on 23rd Jan. The police rejected the requests of the protesters demanding more time to discuss and to obtain legal advice over the state issued ordinance. The state police started the process of forcefully evicting the people who campaigned peacefully and those who resisted the eviction was severely beaten and lathi chargedxii. This week long protests and occupation of Marina did raise serious question about the role of state behind these upsurges! There are seasonal politicians and elements in the left framing their perspectives from conspiracies rather than the concrete material conditions thus portraying the state as a principal operator behind these mass outbursts. The arguments to exaggerate the role of state repression as an overwhelming factor against the spontaneous rising of the people are only going to undermine the anti-establishment mood out there. In an oppressive regime the state as an institution is an instrument of repression of the ordinary people but at the same time the state got to stabilise itself in accordance with the balance of forces. In other words the state has to let off the steam of mass upheaval through some outlets! But to portray the hundreds and thousands of students and millions of supporters as puppets with the state performing the act behind the screen is just a poor plotline! Particularly Tamil Nadu is politically volatile and the government machinery, the police and intelligence have toughened up during the 2008 and 2013 protests against the Sri Lankan civil war, the war crimes against the Tamils in Sri Lanka and the 2011 anti Kudankulam nuclear power plant protests. Those protests and the ensued disillusionment with the growing levels of unemployment, poverty, and income inequality as direct consequences of neo-liberal policies and financial recession have produced solid conditions for the growing discontent amongst the people. It is not at all surprising to see a lot of students; unemployed graduates are clearly in rage with this capitalist system and the corrupt political outfits! There was a clear disregard amongst the demonstrators over Modi and the central government as the impact of demonetisation which took its toll on all layers of the ordinary people and the alarming rate of the farmers’ suicide in Tamil Nadu and particularly in the Cauvery delta region. Days before the Jallikattu issue took off it was the appalling increase in the farmers’ suicide over the crop failure due to a severe drought the administrative mismanagement of the government and the lack of water from Cauvery. There was a wide spread resentment amongst the people in Tamil Nadu with the Cauvery water sharing debacle with the Karnataka where the Supreme court’s directives were consciously ignored by the Karnataka state government with government in the centre turning a blind eye towards it. This sparked off a lot of agitations and protests across Tamil Nadu, furthering the cause of Tamil Nationalism. Throughout the political time line of Tamil Nadu there was always an element of high handed approach of the central government over the regional interests of Tamil Nadu back in the days of anti-Hindi imposition agitations and the strong regional sentiments has its legacy rooted in the Dravidian movement led by Periyar. These dynamics were seriously assaulted with the present BJP government of Modi in the centre and with its authoritarian way of infringing the regional interests with a pan Hindutva nationalist agenda there is a continuing array of attacks over the cultural and the traditional sentiments of the Tamil people. With a string of measures like the New Education Policy, enforcement of NEET exams, etc., the government in centre is enforcing its hegemony over the regional interests. Also after the death of the former Chief Minister Jayalalithaa and with the controversies around it there is a sense of powerlessness to uphold regional values. And when the traditional Tamil festival Pongal was only given a restricted holiday instead of a compulsory holiday it sparked of a huge uproar amidst the Jallikattu issue, and even though this was the case for around the last 15 yearsxiii, and it’s becoming a controversy now, indicate the growing feeling towards the Tamil identity and the increasing bitterness against the centre. At the same time these eventful political upsurge over the Jallikattu indicates the utter failure of the establishment parties. The protest movement boycotted the intervention of the political parties – shows the distrust and the disillusionment among the youth over the mainstream parties. It’s unfortunate that even the ‘so called’ communist parties are not looked upon as an alternative and in fact they were considered as partners in crime with those corrupt political parties who were their previous coalition partners. At the same time the students and the youth could have made use of the political experiences of activists and non sectarian left and progressive organisations that are in solidarity with the protests and have so far acted upon in the interests of ordinary people. This would have helped the fresh forces of the protests with the much needed political strategies and experience. With a structured organisational committee and a political leadership reflecting the anti establishment aspirations of the protester, this huge group of young people could have consolidated a state wide strong students and youth movement that could have played a determined role in the present political vacuum. 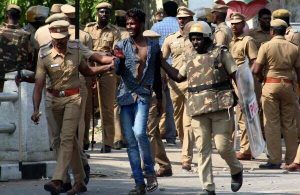 After the forced evacuation of the Marina beach protesters a massive state crackdown is going on in Chennai targeting the ordinary people particularly the fishing communities and the people in the slums nearby Marina who actually safeguarded the protesters against the onslaught! The police forces are vandalising the personal properties of the people. With the mobile phone camera videos it’s been splattered all over the social network showing the police apparently pelting stones over the protesters, setting fire on the autos, dwellings, etc. The entire fish market was totally destroyed and many in the nearby fishing communities including women and children were brutally beaten up and the men were detained. These are not just police excess but a conscious exertion by the state to spread terror with intent to shun off any future protests of this nature. The National Human Rights Commission (NHRC) has issued notices to the state police including the Chennai police Commissioner and yet the state is brutally tightening their grips! Even a higher police authority advised the parents to check on the possible influence of radical left groups and progressive activists by going through their mobile phone contacts as they would probably using the prefix ‘thozhar’ a traditional Tamil expression for Comrade! There are reports with the teaching staffs and faculties been warned by the college management to be watchful of the students for any unusual activities! All this could lead to an assault to the existing democratic space no matter however little already it is! Section 144 was imposed in Marina prohibiting all meetings, assemblies, demonstration, etc., in and around Marina. There were criticisms made against those scores of young people for not rallying for far important issues than Jallikattu! Nevertheless this ban on Jallikattu and the subsequent events flowed from it are just that one high friction which sparked off the youth and the students who then rallied the aspirations of the wider society. On the other hand, the movement is propelled by the conditions of this rotten society and these conditions will remain to trigger huge struggles in the next period! This massive demonstration in Marina, flooded with the protesting youngsters is changing the disposition of Tamil Nadu politics. There are a lot of senseless controversies going on all over about this. But we got to look into this very fact – that a lot of young people is challenging the governments of the state and the central, and this by itself is a step ahead than what it is used to be! This upsurge amongst the students and young people are not triggered by a single issue and neither will their consciousness be limited to narrow confines. These eventful few weeks in practice provided an enormous material for the youth and students to understand political struggle. For many it was a firsthand experience of state violence and its character. However the lesson that’s been learned in this practical process of defying the establishment is here to stay and radicalise this young generation to be a fighting force against the failed system! It was nevertheless a fantastic learning experience for our comrades in Chennai. We will strive to work with the combative layers of young people who have gathered a lot of political understanding in those few days. Our determined forces of the New Socialist Alternative will continue to build a democratic socialist platform of the students’ activists and campaigners who are reflecting the interests of the ordinary people, socialists, and working class forces to stand up against this decay of capitalist system! PS: By the time of publishing this article, the Chief Minister of Tamil Nadu O. Panneerselvam has resigned and he is no longer the chief minister of Tamil Nadu. Jayalalitha’s aide and AIADMK general secretary V.K Sasikala is set to be sworn-in as the next chief minister. i Occupy movement – protests which grabbed the global headlines post the 2008 global financial crisis. viii While it is true in the general context, but in states like Andhra, Telangana, Maharashtra and Odisha land holdings of hundreds of acres are still existent. During the time of Indira Gandhi’s “land to the Tiller” false, many of these land holdings were switched to Benami holders. Tamil Nadu – Yet another election where people had no choice! 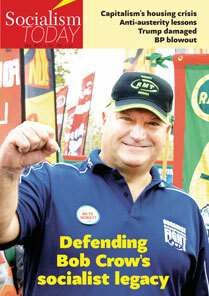 Torch protests, child labour and the multinationals! Democracy: Of the people, By the people, For the People – Oh Really? !